Surfer and Special Forces vet Pono Hawkins leaves Hawaii for Maine's brutal winter to help former SF buddy Bucky Franklin beat a politically motivated murder rap. Pono quickly learns that Maine is as politically corrupt as Hawaii, with huge energy corporations gobbling up the state's beautiful mountains and purchasing its politicians at bargain prices. He is hunted, shot at, betrayed, and stalked by knife-wielding assassins as he tries to find the murderer and free his buddy. Nothing is certain, no one can be trusted, no place is safe. And with a rap sheet that includes two undeserved jail sentences, Pono is a target for every cop in the state. 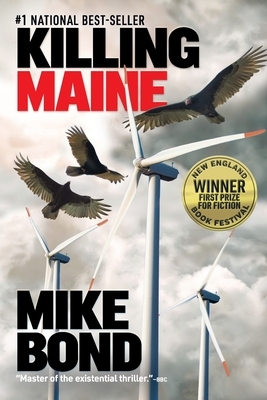 Second in the Pono Hawkins series after the critically-acclaimed, best-seller SAVING PARADISE, Mike Bond's KILLING MAINE is an insider's view of crooked Maine politics and industrial crime, the state's magical and fast-disappearing natural beauty, how a lone commando hunts down those who hunt him, and is based on the author's own experiences in Maine, the Middle East and elsewhere. Called "master of the existential thriller" by BBC, "one of America's best thriller writers" by Culture Buzz, and "one of the 21st century's most exciting authors" by the Washington Times, Mike Bond is a best-selling novelist, war and human rights journalist, and environmental activist. He has covered guerrilla wars, death squads, and military dictatorships in Latin America and Africa, Islamic terrorism in the Middle East, and ivory poaching and other environmental battles in East Africa and Asia. His critically acclaimed novels take the reader into intense situations in the world's most perilous places, into wars, revolutions, dangerous love affairs and political and corporate conspiracies, making "readers sweat with [their] relentless pace." (Kirkus) and drawing them "into a land and a time I had not known but left me with my senses reeling." (NetGalley Reviews) His books have been named among the best of the year by reviewers and readers alike. He speaks multiple languages, has climbed and trekked over 50,000 miles on every continent from the Antarctic to Siberia, and is at home in some of the most primitive and dangerous places on the planet.